President Obama, acknowledging his part in spurring the media circus around the arrest of Harvard scholar Henry Louis Gates, Jr. through his “stupid” remark about the case (which has by now been downgraded from Exhibit A: Racial Profiling Epidemic to Unfortunate Incident), and wanting to shut that circus down so that we can resume talking about life-and-death stuff like health care and the war in Afghanistan, is having Gates and Cambridge Police Sgt. James Crowley over to the White House on Thursday for a beer. Asked what beer the president might have, [Spokesman Robert] Gibbs observed that Obama drank a Budweiser at the baseball All-Star Game a couple of weeks ago. “Sgt. Crowley mentioned when the president offered this on the phone Friday that he likes Blue Moon,” said Gibbs. Blue Moon is a Belgian-style white beer brewed by Molson Coors. Gates told the Boston Globe he was a fan of Red Stripe, a Jamaican lager, and Beck’s, a German lager. Oh, god. Bud, Blue Moon and Beck’s? Really, gentlemen? Is the meeting at a Ruby Tuesday’s or something? Not to mention the fact that every one of these brews is made by a global conglomerate. Can I interest you in something still well-known (i.e. not “elitist”) but American-made — Sam Adams, maybe? Fitting that it originates from the city across the river from the incident. Or maybe the Cambridge guys could bring a local brew from their city, while Obama brings a D.C.-made beer to the table. I suggest, given Crowley’s taste for unfiltered wheat ales, that he grab a growler of hefe-weizen from the Cambridge Brewing Co. Mr. President, you bring some Capitol City Kolsch for yourself and Mr. Gates. That way you get symbolism and flavor. You’re welcome. Let me know if I can be of any further help. Avery Brewing Company’s Ale to the Chief or Six Point Craft Ales’ Hop Obama Ale both seem like good choices to me. I thought of suggesting those, Fred, but then again it’d probably be a bit upper-handed of Obama to bring along beers crafted in his honor. Great post. I’m glad you picked up on this. I went to Fenway last night to see Jim Rice’s #14 retired. During Rice’s speech I was hoping he would say that the only thing that could top off his long Hall of Fame weekend would be a trip to the White House with his fellow ‘Gold Dust’ twin Fred Lynn, to enjoy a beer with the President. The place would have gone wild in light of Gatesgate. Wow, Patrick, what a treat to be at Fenway for Rice’s moment! And thanks for the link to the article about Gold Dust. I was at that game last night too. It was a treat through the 8th inning, after that… not so much. But if Irish American police officers are now admitting publicly that they enjoy Belgian style white beers then America is apparently a far more tolerant and open society than I thought. I remember when simply ordering a beer like that in Medford would encourage bartenders to give you immediate directions to Harvard Square as well as a 3 letter nickname rhyming with “dag”. Not to be argumentative, but in this climate an ice cold can of Budweiser is so much more appealing that a Sam Adams. It is part of an evil European conglomerate, but it’s so goddamn refreshing. The sad part is that he will actually drink a Bud Lite, from what I read. 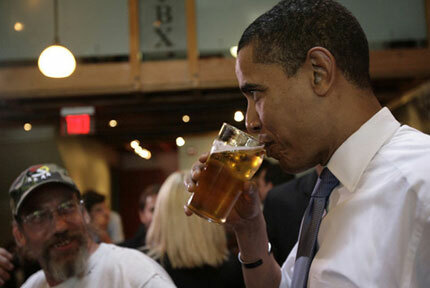 Maybe we should all, in some way, educate Obama on the myriad of beers he has to pick from. Isaac, thanks for weighing in — drinkboston loves arguments! I agree that a Bud *can* be goddamn refreshing. In all my years of writing about craft beer, I stood by my approval of Bud to most of my colleagues’ disgust. In this particular case, though, I was disappointed more in the collective vapidity of the mens’ choice of beer. I’ll see you soon for a cold one. I like Obama, but my guess is that his choice of Bud is a carefully-crafted, deliberate one. It’s designed to defuse the kind of critics who would jump on him for choosing something more interesting and artisanal, undoubtedly flinging the “latte-sipping, Volvo-driving, Ivy-League-educated, big-city elitist, out of touch with *real* Americans” rhetoric. Given his druthers, I imagine Barry drinking a well-chosen glass of red wine. Wouldn’t surprise me to learn he’s actually got much more sophisticated taste in beer, too. And now we all know that Obama did indeed have a Bud Light and Crowley did indeed have a Blue Moon. But Sam Adams beat fellow New England beers ‘Gansett and, apparently, Harpoon, to the White House, with Skip Gates settling on a Sam Light. (VP Biden, a teetotaler, had a Buckler.) A nice image, I must say, but I’m insatiable about these things … my mind’s eye kept superimposing imaginary footage of FDR drinking a martini and smoking a cigarette. I just saw a clip on the Daily Show of Fox News, which criticized Obama for drinking Bud Lite, as it’s now owned by Belgian-based InBev: “Maybe this would have been a good time to buy America?” Yep, when the President does it, Fox suggests, drinking Anheuser-Busch products is un-American. That might be funny, but I don’t find Fox News amusing at all.